The name might mislead you into thinking that these insects are related to fish: far from it. They actually got this name from their silvery colour and the fish-like appearance of their movement. Silverfish, otherwise known as fishmoths are small wingless insects that feed on starches, sugar, dextrin in adhesives and other carbohydrates/polysaccharides. 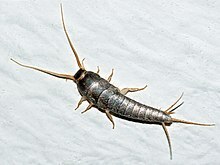 Although capable of surviving most environments, Silverfish prefer to live in moist areas such as bathtubs, sinks, attics, and showers. If left unchecked silverfish could eat/destroy your books, clothing made of natural fabrics such as cotton and silk, carpets and photos. They could even go as far as consuming your synthetic fabrics and leatherwear in times of famine. They are very hardy creatures and can survive for up to a year without feeding. The fertilisation of a female silverfish is preceded by a ritual involving three phases. This ritual could go on for as much as an hour. In the initial phase, the male and female engage in a dance (I do not kid) in which they touch antennae, then repeatedly back off and then return to the same position. After the dance the male runs away with the female following in hot pursuit. That’s the second phase. In the third and final phase, the male and female stand side by side with the male vibrating his tail against the female’s body. The male then lays a spermatophore which the female takes into her body for egg fertilisation. After ‘mating’, the female then lays her eggs in small crevices. The oval-shaped eggs take between 14-60 days to hatch. The hatched nymphs come out white in colour with the rest of their looks resembling those of the adult silverfish but on a smaller scale. The nymphs will start moulting and gain their silver colour as they mature – a process which will take three months to three years. Silverfish will continue moulting for the rest of their lives. If you don’t already have silverfish in your home, you should take the following measures to ensure that these destructive creatures do not find a home in your home. 1. Eliminate any sources of excess moisture in your home such as condensation and faulty plumbing that leaks. 2. Dehumidify your home. Just like the first measure, this measure also deprives silverfish of humid areas to dwell in.  Running the air conditioner or the fan to reduce humidity.  Drying any standing water inside the house.  Ventilating attics and other closed rooms. 3. Eliminate Silverfish food sources. Store cardboard boxes on shelves where they are less likely to get damp, keep stored food in sealed plastic containers rather than boxes, replace old wallpaper with new wallpaper or paint, and place clothing you do not wear in plastic bags. 4. Vacuum regularly to get rid of eggs and adult silverfish. If silverfish have already invaded your home, there is no need to worry. Our silverfish control products will help you get rid of these nasty creatures without breaking a sweat. This device will make silverfish a thing of the past in your home. It will not only get rid of silverfish but also other flying and crawling insects. Make your home a haven free of pest insects with the amazing Pestrol Ultra Dispenser. It’s safe for you and your pet.